When you think about an electric pressure washer Annovi Riverbery is the brand that comes to your mind. It is the leading electric pressure washer maker in the market. They have a long history in developing good quality pressure washer and many other home appliances. AR Blue Clean AR112 1600PSI 1.58 GPM Electric Pressure Washer is one of their best pressure washers. They developed it for the purpose of residential use. It has an excellent motor and a good quality pump. The device provides a moderately good water pressure of 1600 PSI and water flow of 1.58 GPM. This combination is more than enough for cleaning the dirt from your home, car, driveway, fence, RV and many more. All the features of this device make it very special in the pressure washer world. The cost of the product is not very much. Before you make the purchasing view all the features and good qualities it will serve you. The machine uses a 12Amp / 1.3 universal motor and a latest model tri-axial pump. It runs totally on electricity. The motor produces 1600 PSI of water pressure. It is enough for cleaning all the tough dirt easily from most of the surfaces. The pump delivers 1.58 GPM of water flow keeping your intention in mind. The device provides a pro-style spray gun that is designed with quick coupler fittings. It installs or removes hose, lance and detergent bottle easily. They provide different nozzles, lances for different purpose. AR Blue Clean AR112 1600PSI 1.58 GPM Electric Pressure Washer has the 20-foot high-pressure hose that can easily tolerate and control a high pressure. The device also provides a 35-foot long power cord. There is a feature of Auto-Reset GFCI module plug for your safety on a wet ground. You will be getting a 14 oz. detergent bottle for easy detergent application. The device has a modern feature Total Stop System (TSS) feature that will stop the machine when you do not engage the trigger. The accumulated weight of the machine is 18.1 pounds and it has a dimension of 18 inches in height, 9.5 inches in width and 8.5 inches in depth. Convenient Motor: With most of the pressure washers we see that when we need the power of water pressure to clean the tough dirt we don’t get it properly. With AR Blue Clean AR112 1600PSI 1.58 GPM Electric Pressure Washer you will get a perfect combination of power and the water flow. It uses electrical current and produces very less noise so that you don’t get disturbed. Total Stop System (TSS): This feature will help you in automatically stopping the motor while you are not actually using it. Thus making the life of your motor longer and saving the valuable energy it serves you like a faithful friend. Detergent Tank: Its 14 oz. integrated detergent tank gives you relief from carrying a bucket of detergent when you are busy. 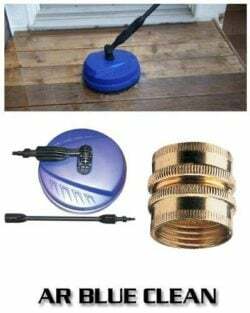 Along with the HP hose and the power cord, you will get a good stretch and you can easily clean your things outside the home. You can easily connect the pump with your garden hose whenever you need. Warranty: You will get a 1 year of bumper to bumper warranty to protect your investment. For all your problems the Company will always stay with you. Some users found that the hose sometime leaks when it is being used. Though most of them didn’t found this kind of problem. You might find the storage for the power cord is a little short to fit the entire cord around it. These are actually some minor issues that you might find with many pressure washers. In this competitive market you get many options to buy a pressure washer but among them, it becomes difficult to select the best option. 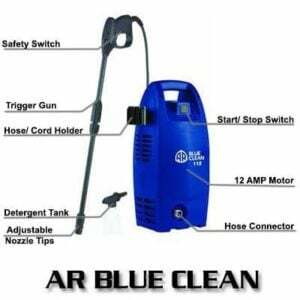 Buying AR Blue Clean AR112 1600PSI 1.58 GPM Electric Pressure Washer can be your one of the best options that you take. It will provide you support without any hesitation and will always be with you. Its light weight helps you to carry the device easily from one place to another. The machine gives you power, strength, durability, and many more things and it costs pretty less. All the modern technologies are included in this device. Click To Check Latest Price & Buy with FREE Shipment on Amazon, Now! Power’s not awful to something you need to connect to. Needed to scrub siding before washing. Not industrial stability but rather enough for home. Be mindful so as not to shock yourself! Thanks for the kind suggestion. We are glad that you gave the honest opinion. For cleaning industrial area, you have to use high PSI pressure washer. You can go for a gas pressure washer because all of them are high PSI pressure washer that will help you to clean your industrial areas and tough cleaning. I got it to wash my deck and it worked incredibly. I’ve now discovered a bundle of employment from washing windows to my auto. I wish I could splash down my kitchen with it! This pressure washer is really incredible to wash house rooftop, garage, windows etc. We already mentioned the major cleaning area in our article. We hope that it helped you. Thanks for your compliment.